Hello and thank you for taking an interest in ‘who we are’! Behind the Magic Door’s ‘Letter Adventure’ is no ordinary personalised book – it is so much more! This is the first book from the team at Behind the Magic Door and they have deliberately set the benchmark stratospherically high for this one! The key features section describes some of what makes it so special including added design features to make shared reading great fun (bedtime stories are the best after all!). We’ve also included some great ‘keepsake’ features making the book an ideal gift, right from New Born through to about age eight. There is a strong moral theme throughout and every child’s name results in a different adventure with different characters. This Letter Adventure will help unlock your child’s creativity, stir their imaginations and help them to understand their own identity and place in our fascinating world. There’s so much more to explore, behind the magic door. "Why our book is an amazing gift for your special 0-8 year old. 4. Illustrations, illustrations and illustrations – yes – we are so excited that we persuaded Adam to do the illustrations for our book. He is fantastic and has created the most amazing set of characters and scenes. They are all available for you to see online before you purchase. Please use the ‘create your book’ to try out different letter options and see what got us so thrilled! 8. Wide format – recognised as the optimum way of showing full page illustrations. Additionally our books are printed on 200GSM paper to give a real luxury feel. 9. 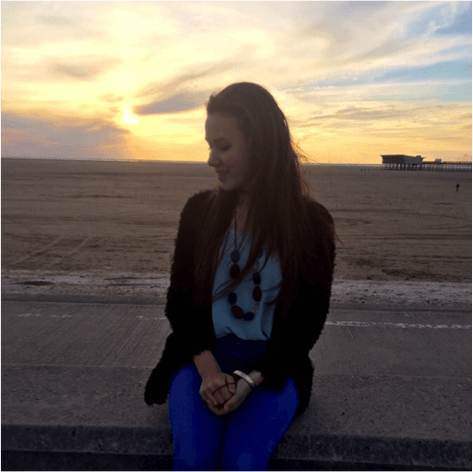 Bespoke story – yes – EACH story is different and unique depending on your child’s name. JANE would meet a Jaguar, Alien, Ninja and Elephant where RICK would meet a Rhino, Iguana, Cheetah and Koala. Who will your child meet? 10. A real adventure – Not all books are equal! In our the young adventurers need to beat the Shadow King to recover the letters of their name. They are accompanied by their Teddy, taking on the role of an advisor / conscience (think Jiminy Cricket in Pinocchio) and they have a clear quest that takes them through challenges and new learning’s (basically all of your classic storytelling techniques rolled into one great adventure!)" This particular children’s book is the result of a huge amount of work from a great many people. We are incredibly proud of what we’ve managed to create – but what does that mean for our customers? We are passionate about providing the very best books and the very best service. • Our reputation is hugely important to us. That’s why we put our brand name on every single book. • We know that our end customers (the children) are incredibly special and frankly you just don’t mess with bedtime stories – our job is to help you make them truly magical experiences. 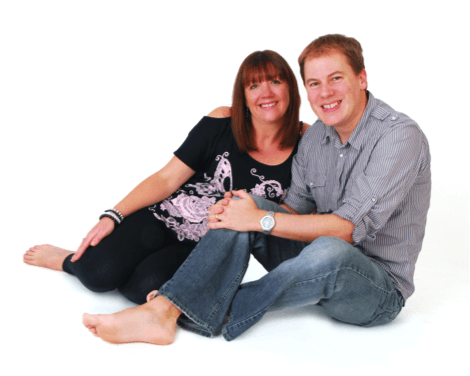 The husband and wife team that established the business. Richard is a qualified accountant (not to be held against him) and has held a number of senior roles in industry, specialising in customer services and sales. He is now using his previous experience to make sure that Behind the Magic Door can reach its global potential. You can read more about our own epic adventure and how we developed the book on our blogs. We are so impressed with Nicole. To have written a book like this at only 15 years old is a great testament to the amazing things our children can achieve. Nicole has loved books from a very young age and does lots of writing for fun. Currently on course for top marks in English Language and English Literature, Nicole is taking a well earned break from the writing to focus on her exams (we know – not really much of a break at all). Let’s hope we can persuade her to come back and add some more magical characters when her exams are out of the way. Adam is our super talented illustrator. 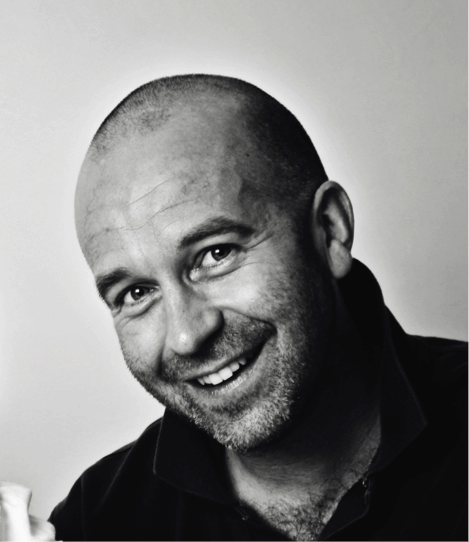 Adam benefits from having worked in graphic design for 20 years, having worked for a well known greeting card company in his early years and more recently doing the illustrations for a number of different children’s books (usually under a pseudo name). Thankfully we persuaded him to add his name to our book as we think he should be allowed to bask in some glory for the quality of the imagery. Ok – so he’s not technically part of the team yet, but he does help to inspire us all. He already loves stories and has an amazing attention span (we often do three in one go) – albeit he is very keen to help, particularly with the page turning. We obviously got him his own special copy of our book (written by his big sister). At the moment he enjoys the ‘pictures’ best as he’s only two, but he’s already starting to pick up on some of the repeated words (great feature!). We work with numerous partners behind the scenes. Two of them have taken leading roles to make sure that the books are totally amazing and that they get to our customers in a timely manner and to the highest quality. Is a leading Manchester Marketing Agency. They have done all the heavy lifting to create the full ecommerce platform (our web site) as well as providing specialist support for the story; branding; strategy; marketing and content. Too many individuals involved to name them all here but considerable support that is both recognised and appreciated. We knew from the outset that our book needed to be printed using the very latest digital print technology. Additionally we needed a print partner that would share our values and aspirations. Put simply it isn’t about the transactional element of printing the books (important as that is). It is far more about finding a partner that will proactively contribute ideas and help us to drive the business forwards. 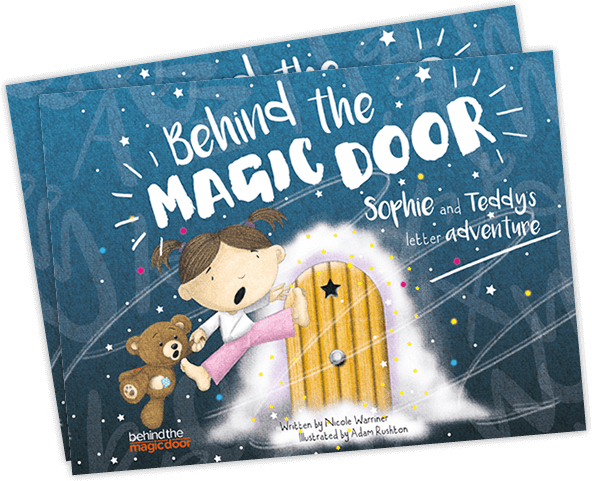 Behind The Magic Door has your child as the adventurer rescuing the letters of their name. Inspiring children's imagination, creativity and curiosity.